Pope Francis waves to gathered worshipers as he leaves St. Patrick's Cathedral after presiding over an evening prayer service, in New York, September 24, 2015. Three days into his historic first visit to the United States, Pope Francis shifted his attention from the nation’s political capital to its economic heart. Francis left Washington, D.C., Thursday afternoon and flew to New York City where the 78-year-old pontiff was met with huge cheering crowds as he continued his jam-packed itinerary. Thursday evening, he led an evening prayer service at St. Patrick’s Cathedral in midtown Manhattan. On Friday, Francis is scheduled to address world leaders at the United Nations General Assembly, then join in a multi-faith service at the National September 11 Memorial where the World Trade Center once stood. He’ll visit a Catholic elementary school in the heavily Hispanic and black neighborhood of East Harlem. In the evening, he’ll celebrate a Mass at Madison Square Garden before an estimated 20,000 worshipers – and will sit on a chair primarily built by day laborers. The pope plans to leave Saturday morning for two days in Philadelphia, his final U.S. stop for the Vatican-sponsored World Meeting of Families. On Sunday, he will celebrate an outdoor Mass, which is expected to draw nearly 2 million people. In New York, Francis is expected to focus on climate change, migration and immigration in his U.N. address. The organization on Friday starts a three-day summit to adopt new goals aimed at ending poverty and inequality and combating climate change. 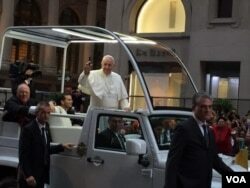 Earlier in the day, when the motorcade stopped at the cathedral where throngs cheered and yelled greetings at the pontiff. He shook hands with people, and met with assembled New York brass as he made his way into the vast and grand cathedral that recently underwent a $177-million renovation. His flight departed Thursday afternoon from Washington’s nearby Joint Base Andrews and landed at New York’s John F. Kennedy International Airport in the late afternoon. Pope Francis engages well wishes as he kisses a child after arriving at John F. Kennedy International Airport in New York, Sept. 24, 2015. He spoke with gathered schoolchildren after getting off the plane, and they gave him a book of prayers written by students. He gave each child a pat on the head, and laughed when they handed him a bobblehead version of himself. 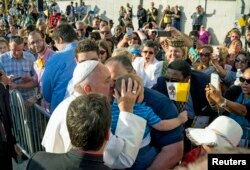 The 78-year-old pontiff continues a jam-packed itinerary in New York. Francis incorporated themes of ending poverty, inequality, giving, combating climate change and sacrifice into his speech Thursday to Congress, the first ever by a U.S. pope. Rich nations have a moral obligation to aid the vulnerable, Francis suggested in discussing "the creation and distribution of wealth." "The right use of natural resources, the proper application of technology and the harnessing of the spirit of enterprise are essential elements" of an inclusive, sustainable economy, he continued. Referencing his recent encyclical on the environment, "Laudato Si’," Francis called for "a courageous and responsible effort to ‘redirect our steps’ … and to avert the most serious effects of the environmental deterioration caused by human activity." As for coping with the worst refugee crisis since World War II, Francis urged compassion, not hostility. "We must not be taken aback by [migrants’] numbers, but rather view them as persons, seeing their faces and listening to their stories, trying to respond as best we can to their situation – to respond in a way which is always humane, just and fraternal," he told Congress. After the speech, Francis went onto the Capitol balcony to address thousands gathered below. Speaking in Spanish, he said, "I'm so grateful for your presence. The most important ones here, children, I'll ask God to bless them." Standing next to him, U.S. House Speaker John Boehner dabbed at his eyes with a handkerchief, overcome with emotion. Francis concluded his remarks in English, saying, "Thank you very much and God bless America." The crowd erupted in boisterous cheers. VOA's Carolyn Presutti contributed to this report from New York.